In recognition of the 501st anniversary of the beginning of the Reformation, Light from Light hosted a giveaway of a copy of the Christian Book of Concord, Second Edition from Concordia Publishing House. 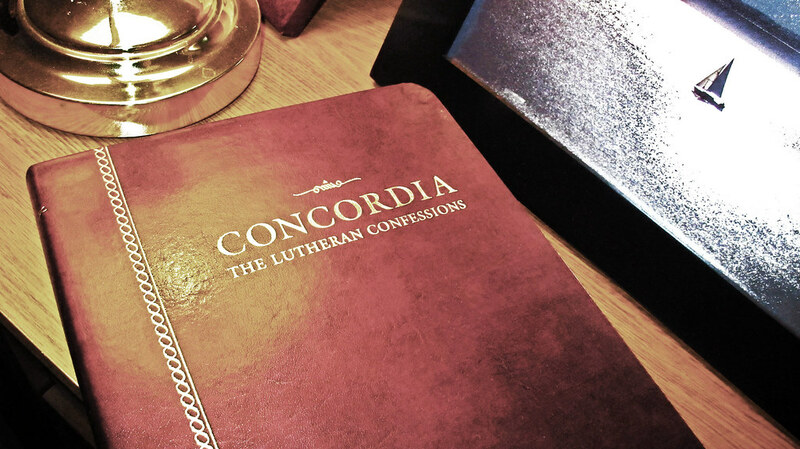 The Book of Concord should be in every Lutheran home. If a person isn’t familiar with this book, he’ll think, ‘That old book is just for pastors. I don’t have to preach. After working all day, I can’t sit down and study in the evening. If I read my morning and evening devotions, that’s enough.’ No, that is not enough! The Lord doesn’t want us to remain children, blown to and fro by every wind of doctrine; instead of that, He wants us to grow in knowledge so that we can teach others. Click here for additional reasons why every Lutheran home should have a copy of the Christian Book of Concord. May God bless you in the upcoming holiday / holy-day season. When our Lord and Master, Jesus Christ, said ‘Repent,’ He called for the entire life of believers to be one of repentance. In recognition of this 501st anniversary, I would like to give away a copy of the Christian Book of Concord bonded-leather-cover Second Edition from Concordia Publishing House. This is similar to the regular hard-cover Second Edition, except it has a bonded-leather-cover with gold trim on the page edges and comes in a gift box. The condition is new, never used. If you would like to enter the drawing for a free copy, just fill out the form below. However, you must be at least 18 years old, may enter the drawing only once, and you must be a resident of the United States. After the winner is chosen at random, all names and emails will be permanently deleted. The deadline for entries is 12 noon CDT on All Saints’ Day, Thursday, November 1, 2018 A.D. In recognition of the five hundred year anniversary of the beginning of the Reformation, Light from Light hosted a giveaway of a copy of the Christian Book of Concord, Second Edition from Concordia Publishing House. Seventy-two people entered. The winner chosen at random was David P.
In recognition of this 500th anniversary, I would like to give away a copy of the Christian Book of Concord bonded-leather-cover Second Edition from Concordia Publishing House. This is similar to the regular hard-cover Second Edition, except it has a bonded-leather-cover with gold trim on the page edges and comes in a gift box. The condition is new, never used. After the winner is chosen at random, all names and emails will be permanently deleted. The deadline for entries is 12 noon CDT on All Saints’ Day (Wednesday, November 1), 2017 A.D. In recognition of this 499th anniversary, I would like to give away a copy of the Christian Book of Concord bonded-leather-cover Second Edition from Concordia Publishing House. This is similar to the regular hard-cover Second Edition, except it has a bonded-leather-cover with gold trim on the page edges and comes in a gift box. The condition is new, never used. After the winner is chosen at random, all names and emails will be permanently deleted. The deadline for entries is 12 noon on All Saints’ Day (Tuesday, November 1), 2016 A.D.
Homily for Trinity 19, Church Postils. In recognition of this 498th anniversary, I would like to give away a copy of the Christian Book of Concord bonded-leather-cover Second Edition from Concordia Publishing House. This is similar to the regular hard-cover Second Edition, except it has a bonded-leather-cover with gold trim on the page edges and comes in a gift box. The condition is new, never used. After the winner is chosen at random, all names and emails will be permanently deleted. The deadline for entries is 12 noon on All Saints’ Day (Sunday, November 1), 2015 A.D. In recognition of this 497th anniversary, I would like to give away a copy of the Christian Book of Concord bonded-leather-cover Second Edition from Concordia Publishing House. This is similar to the regular hard-cover Second Edition, except it has a bonded-leather-cover with gold trim on the page edges and it comes in a gift box. The condition is new, never used. After the winner is chosen at random, all names and e-mails will be permanently deleted. The deadline for entries is 12 noon on All Saints’ Day (Saturday, November 1), 2014 A.D. This is my favorite picture from the Reformation: it is of Martin Luther using the word of God to point to Christ crucified. 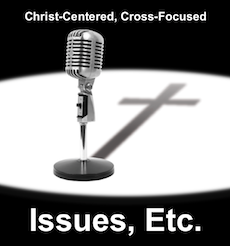 This is the goal of all Christian reformation: to direct and redirect men to Christ. For I resolved to know nothing while I was with you except Jesus Christ and him crucified… My message and my preaching were not with wise and persuasive words, but with a demonstration of the Spirit’s power, so that your faith might not rest on men’s wisdom, but on God’s power. All congregations on earth are always in need of constant reformation. However, some don’t know it. For more information on the above painting by Lucas Cranach (the elder), check out this post entitled “Cranach in the Study” by Pastor Caauwe. The following are five quotations from Martin Luther on the subject of faith. They are taken from What Luther Says, compiled by Ewald M. Plass, Volume I, pages 477-479, paragraphs 1412-1415, and 1420. Luther contended that salvation is the free gift of God, and therefore could be received only though faith, and that faith itself is a gift of God. Says Plass regarding paragraph 1412: Faith is “a work performed in us rather than by us.” Faith is a divine work that produces all the other works below it. Faith is full of life and power. It is not an idle thought. It does not float on the surface of the heart, as a goose does on water; but it is as water that has been warmed by fire. Although such water remains water, it is no longer cold but warm and, therefore, an entirely different sort of water. So faith, which is the work of the Holy Spirit, makes the mind and the thinking of a person different and thereby makes an entirely new man of him. Faith, then, is an active, independent (difficilis), and powerful thing; and if we want truly to evaluate it, we should call it an influence (passio) on us rather than an act (actio) performed by us. For it changes our souls and our views. Do not think lightly of faith. It is a work that is of all works the most excellent and the most difficult. Through it alone you will be saved, even though you were obliged to do without all other works. For it is the work of God, not of man, as Paul teaches (Ephesians 1:19). The other works He performs with our co-operation and through us; this alone He works within us and without our co-operation (sine nobis). Faith is a divine work which God requires of us; but He Himself must give us the strength to do it. It is a mistake to place faith and its work alongside other virtues and works. Faith should be elevated above all and regarded, as it were, as a sort of constant and general influence above all works, through the movement and activity of which everything that is in man is sent into motion, works, is vigorous and pleasing. A Christian modestly says to God: Dear Lord, although I am sure of my position, I am unable to sustain it without Thee. Help Thou me, or I am lost. — He is indeed certain of his position, as Peter was on the water (Matthew 14:29). Peter could not be more certain than he was. The water was supporting him. He saw no obstacle in his way. But when the wind came rushing on, he saw what was lacking in him. This must be taken well to heart. For although we are sure of our position, have Scripture, and are covered and armed with clear passages in the very best way, yet our security depends on the power, the will, and the might of God, who protects us and defends us against the devil, our adversary and greatest enemy. But this happens that God may make us determined and yet keep us fearful, so that we are always filled with concern and cry to Him: O Lord, help us, and increase our faith (Luke 17:5); for without Thee we are undone. At heart we should always feel as if we were just beginning to believe today, and every day we should feel as if we had never heard the Gospel before. We must believe anew every day.